This is not about making new years resolutions that are usually broken by January 2nd. This is about turning your goals into action, so you actually have a chance at making them happen! Specific, Measurable, Achievable, Realistic, and Time-Bound. Is your goal specific? It is really hard to achieve your goals if you don’t know what they are. An example of a typical non-specific goal might be: “I wanna just be a working actor”. But guess what? … you can go on the street corner and recite Shakespeare to passerby’s, and you would indeed be “working” but I have a feeling that is not what you really meant. Get clarity and focus on what you really want, take daily action and the universe will comply. The easiest way to look at this part of goal setting is to ask yourself if you can check it off your list. Meaning… something like “I want to be rich” or “I wanna be a successful actor” is wishy washy. And subjective. Your idea of what a “successful” actor is can be very different from the next person’s opinion. And as human nature goes… the more you get, the more you want, so if your goal is to be “successful”, you may never reach that point because your definition of success will evolve as you do. 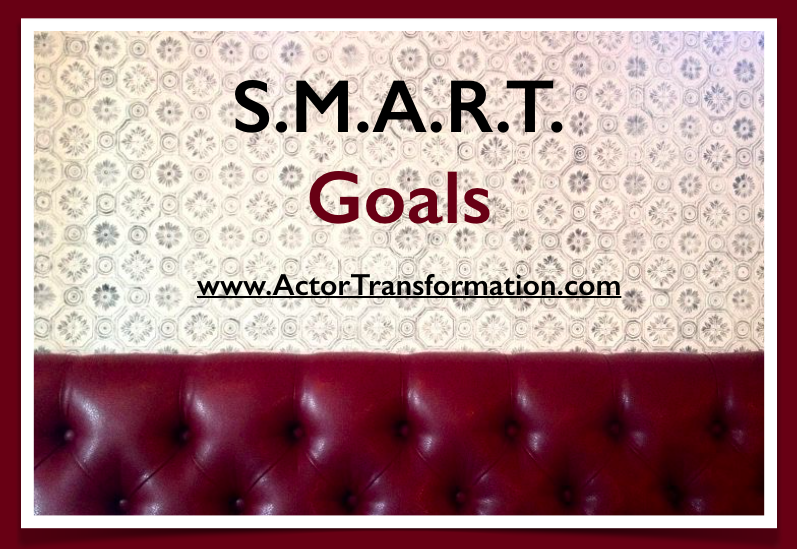 Examples of goals that are measurable could be: “Qualify for my SAG insurance”, or “Book a guest star on prime time television”, because you will know when you actually achieve the goal. And you can check it off your list! Some might say that one way to look at it might be to ask “Has it been achieved before”?. But I believe in breaking new ground, going against the herd, going where no actor has gone before (for you Trekkie nerds out there). An example though of a very challenging goal might be to be nominated for an Oscar. Depending on who you are reading this, it may very well be an achievable goal for you within the span of your lifetime but it is probably an impossibility to achieve this particular goal within this year or next year…simply because most of next years Oscar worthy films are already in the can, or at the least are already filming or in post production right now. So unless your name is “Meryl”, this would be a more achievable goal in the long term. But also remember that there was a time when it was “impossible” to walk on the moon. But with much time, effort, money and the determination of many geniuses, the impossible became possible. So I believe that pretty much anything is possible if you have enough time, effort and determination. But take a step back and look at where you are right now so when you are goal setting, you set yourself up for success instead of disappointment. This one is interesting. It has been said that “people often overestimate what they can achieve in the short term and underestimate what they can achieve in the long term.” So this part of goal setting is very personal to the individual setting the goal. ie If you just arrived in town and have very little experience or credits, a realistic goal for you will probably be different than a realistic goal for someone with a huge level of experience already. Please remember that you can only do what you can do. So often actor dwell on what they don’t have instead of taking action to get to the next level. “Time-Bound” and “Realistic” will sometimes work together. Going back to the example of being nominated for an Oscar… If you are a great film actor, you might put a time frame on that for 15 years instead of 15 months. Putting a specific time on your goals is vital. And I would recommend doing it often. From there you can work backwards to create smaller goals that are fractions of your larger goal. EXAMPLE: Let’s say your main goal this year is to book your first guest star role on television, yet you just arrived in town and have only acted in student films and theatre up until this point. Where do you begin? Your big year goal might be to book a guest star role on network television by Dec 31st, so then maybe by August 31st you need to make a goal of booking a co-star role, and by the next 90 days, you will make a goal to have read for 10 new casting directors who are currently casting shows on your target list. Then in the next 30 days you will create/produce a tv-friendly demo reel, and then TODAY you will work on the first 3 baby steps to producing a reel. Get how this works? And make sure that you keep your actions steps written in a way that they are 100% up to YOU. Meaning… you don’t want a task to be “Have my agent call that producer”. Because that is leaving your success up to someone else. Instead your action item should look something like… “Email a follow up reminder” or “Research single-cam comedy pilots slated for this pilot season”, and so on… because that keeps the ball in your court. *** It is very important to always finish setting any goal with taking the first step towards achieving it. It can be a tiny baby step. But take some kind of action. It could be sending an email. Making a phone call. Getting an accountability partner. Cleaning up your desk….whatever… But make sure you take some small action RIGHT AWAY. Just saying it and then doing nothing about it will not accomplish anything. *** Success and achievement are learn-able skills. Every great achievement always starts with the first step! And that first step is … RIGHT NOW! ***If you want help from Coach Kari in creating major breakthroughs in your career, please grab some private one-on-one strategy coaching: Please Click Here to request more information.